Passengers Cite Inconvenience As Main Concern At Dallas/Fort Worth International Airport, travelers expressed some concerns after last week's foiled attempt to bomb a plane but said flying is a necessity. An airline industry consultant added that fear isn't the main issue for most travelers: They're more concerned with the inconvenience added security brings. A TSA officer screens airline passengers at the Dallas/Fort Worth International Airport on Sunday. Preflight screenings were stepped up after a man was accused of trying to blow up a Northwest Airlines flight Friday. Friday's attempted bombing of a Northwest jetliner could mean more bad news for the nation's struggling airlines. It all depends on how the flying public reacts to long lines, increased security and the knowledge that a suspected would-be terrorist eluded detection. At Dallas/Fort Worth International, one of the country's busiest airports, travelers expressed some concerns, but most took any potential threats in stride. "I'm appalled that all the safety measures and all the precautions that we're taking lately still allow for such a thing to happen," said Hector Gonzalez, a service engineer for a German company who often flies on business. But while dismayed that U.S. authorities dropped the ball and let an alleged terrorist slip through, Gonzalez, who was heading to Puerto Rico with his wife, said he intends to keep flying. "Frankly, I'm really not concerned. I've seen the security," he said. "I feel quite safe." The suspect in the foiled attempt to blow up Northwest Flight 253 was arrested, and for most passengers, life goes on. As he waited at baggage claim for his college-age daughter, Glen Smith said it was important to be realistic. "People are trying to kill us, and I don't think there's anything you can do to stop 100 percent of them," he said. And in today's world, he said, flying isn't just an option; it's a necessity. "What can you do? Somebody is paying you to go somewhere; you've got to go," he said. Robert W. Mann Jr., one of the country's leading airline industry consultants, said fear isn't the main issue for most travelers. They're more concerned with the inconvenience added security brings. "Even for a trip of six hours like London-New York, the idea that you would lose three hours on each end of a trip makes it questionable," Mann said. 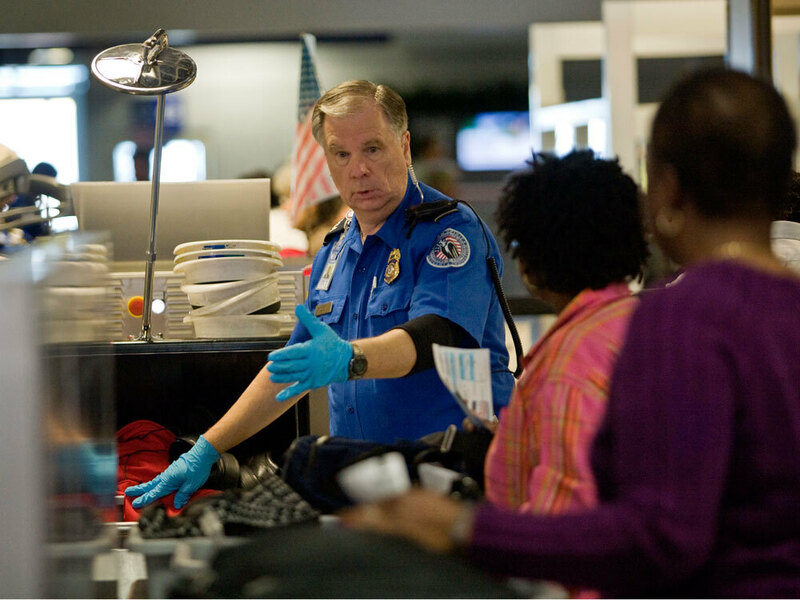 He said he is pleased that the Obama administration is conducting a top-to-bottom review of the Transportation Security Administration. Up to this point, Mann said, the agency's security processes largely have been a failure. "I would go further to say that I'd like to see the next billion dollars invested not in technology with X-rays and puffer machines, but rather with essentially police work done offshore to locate people who would do harm — whoever they may be, wherever they be — and before they ever get to an airport," he said. Mann said he worries about the soft underbelly of the nation's airports, with their long lines of tightly clustered people waiting to go through security and into the safe side of the terminal. He believes more puffer machines — screening devices that the TSA says are capable of detecting traces of explosive residue on a person's body or clothing — will not stop suicide bombers wrapped in vests of C-4 plastique.